Israeli Prime Minister Benjamin Netanyahu, addressing the U.N. Geral Assembly on Thursday, accused Iran of masking a nuclear warehouse inside a rug-cleaning plant. 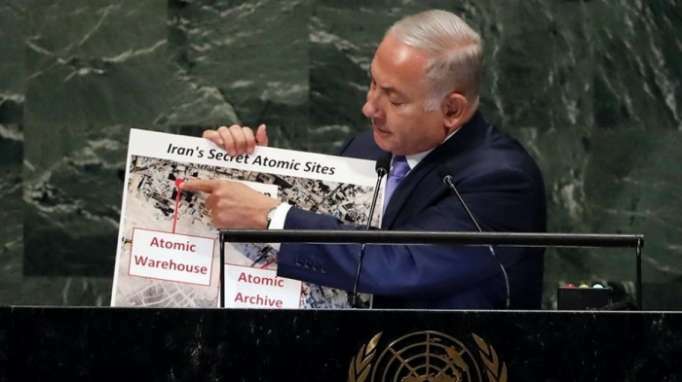 Netanyahu appeared to disclose information about the “atomic warehouse” that was otherwise classified. The Israeli leader called on the International Atomic Energy Agency to investigate the findings, claiming it “has not taken any action” thus far. “It has not posed a single question of Iran. It has not demanded to inspect a single new site discovered in that secret archive," Netanyahu said. "So I decided to reveal today something else that we revealed to the IAEA and to other intelligence agencies." He brandished visual aids — a posterboard map, then a posterboard photo, then another map. Netanyahu vigorously opposes a 2015 deal curbing Iran's nuclear program in exchange for a lifting of sanctions. Iran denies pursuing nuclear weapons. President Trump pulled the U.S. out of the agreement in May. The prime minister is known for its showmanship at the General Assembly. In 2012, he famously held up a poster of a cartoon bomb while discussing Iran's nuclear program.